As part of the NJSGA’s ongoing Rules of Golf educational program, the NJSGA Rules Committee will “bring you along” with a group of players during their round to review common Rules scenarios. The fifth of the series involves the Putting Green. In a stroke play event, players A, B and C have all played their 2nd shots on the 11th hole. Players A and B are on the green, but player C’s ball is off the green – and on the fringe. On C’s line of play is a pitch mark which is partly on the green and partly on the fringe – in addition to two other pitch marks on the green closer to the hole. Player C repairs all three pitch marks before putting from the fringe. Player B’s ball is barely on the green, but because the green slopes severely from left-to-right, Player B’s line of play is through the left fringe. On the fringe, there is a sprinkler head which interferes with his line of play, and player B wishes to take relief from the sprinkler head (which is an immovable obstruction). Player A’s ball is on the green - approximately 10 feet from the hole. However, since it is early in the season and part of the green has natural imperfections (a bare area and some uneven growth), player A wishes to repair this area. Also, the three players all notice that the hole itself is damaged, presumably from the previous group being careless in replacing the flagstick. Damage to the hole itself can be repaired if it was not caused from normal wear and tear. Since damage to the hole was likely caused by the flagstick, it can be repaired and all three players benefit from that. Unfortunately, there is no relief for Player A. While most damage to the putting green can be repaired, natural surface imperfections are not considered damage to the putting green. Player B gets good news – and free relief. Under the new rules, when a ball is on the putting green and there is interference from an abnormal course condition (e.g., an immovable obstruction) that intervenes on the line of play, you get free relief even though the immovable obstruction was not on the green. Player B’s relief point however, must be either on the putting green or in the general area. 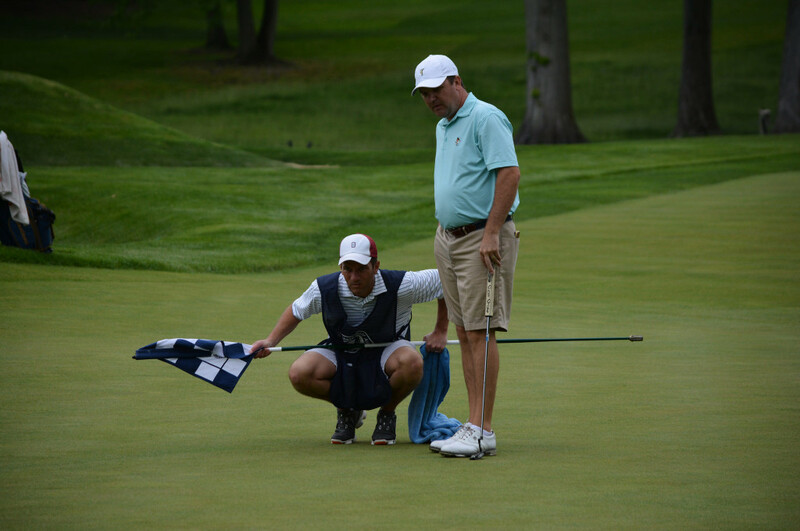 Player C receives no penalty since a player may repair damage to the putting green no matter whether the ball is on or off the putting green. Additionally, the rules allow a player to repair the entire damage even if the damage is partially on and partially off the putting green. This applies not only to pitch marks but also to other areas of damage such as animal tracks, hoof marks, shoe prints or club indentations.